I don't know about you but I, for a matter of fact, make sure to dress up keeping in mind the area I am visiting to! 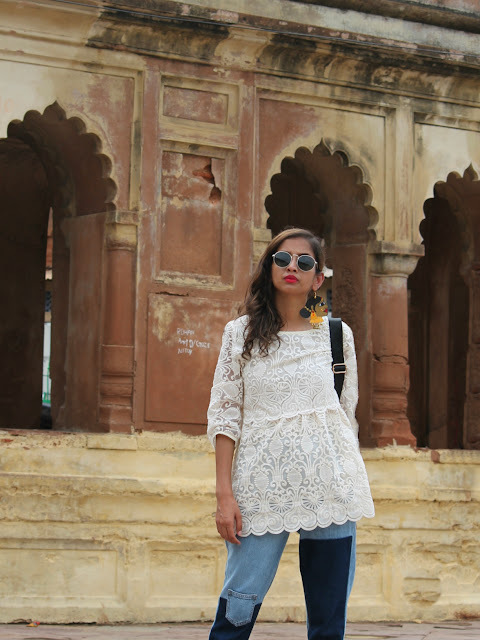 So when I decided to visit the Bada Imambara in Lucknow, I chose to go the fusion way by pairing a beautifully embroidered dress over a pair of dual shade denims. Bada Imambara, like I mentioned before, is a mosque which obviously has religious sentiments attached to it. Respecting that it became a lot more important for me to to choose an outfit which doesn't offend others & do not make me awkward amidst the crowd! But instead of the good old traditional, I very thoughtfully created a contemporary attire. Picked this stunning off-white dress for its intricate details & unconventional hemline and paired it up with mom jeans with colour-block pattern!